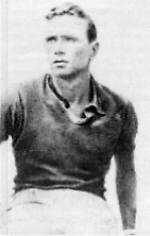 On this date in 1943, Polish-born Greek resistance hero Jerzy Iwanow-Szajnowicz was shot (or shot attempting to escape the Kaisariani execution ground, which amounts to pretty much the same thing) for a dramatic career fighting the occupation of Greece. Iwanow (Polish) — or Georgios Ivanof — was the son of a Russian officer, but his parents divorced in his childhood, and mom married a Greek. Jerzy was on his way to a cosmopolitan upbringing, mastering half a dozen languages and apparently just as many sports. His athletic and linguistic prowess would both come in handy for derring-do missions (more Polish) in the Greek waters that saw him sink a German submarine and a destroyer with magnetic bombs. He even escaped the first two times he was captured. Third time was a charm for the Nazis. Sounds like celluloid material. As a matter of fact, a 1972 Polish film valorized Iwanow as Agent Nr. 1. You can see the full movie on Veoh, if you’re prepared to install their viewing software.